In 1973, Jim Ennes opened a small fabrication shop, Perfection Fabricators Inc., in Elyria, OH. Welding and bending and machining equipment operated by three employees filled the 30 by 40-ft. space. Cut to 2015…Perfection Fabrication still resides in Elyria, a suburb of Cleveland with a glorious industrial past. To stay ahead of the game in a region with a rich history of fabrication expertise, and stay attractive to customers who can source worldwide, Perfection and its 12 employees have embraced new technology. The latest: a waterjet cutting machine from Omax—a Maxiem 1530 JetMachining Center with a 30-hp, 22-kW direct-drive pump. The waterjet joins a formidable arsenal that includes a 3000-W Trumpf laser-cutting machine, 10-ft. Pullmax and Wysong press brakes, Wysong 10-ft. by 0.25-in. shear, and other equipment such as two vertical mills, tube benders and rollers, rollformers and assorted welders. With its flexibility—a must as the company produces 30 to 40 jobs per week at 1 to 500 parts per job—Perfection supplies parts, assemblies and prototypes to numerous big-name companies in tool, industrial, automotive and industrial markets, as well “the little guys.” Fabricated materials at Perfection run the gamut, from glass to plastic, stainless steel, aluminum and cast iron. Impetus for bringing in a waterjet cutter began with the decision to go all-in on new technology in 2011 and buy the laser-cutting machine. “Jim’s son Dave took over the business in 2005, then I took over Dave’s job, and that is when Dave and I decided that it was time to modernize from fabrication’s Stone Age to compete and succeed within the industry,” explains Stacey Gerken, Perfection president. 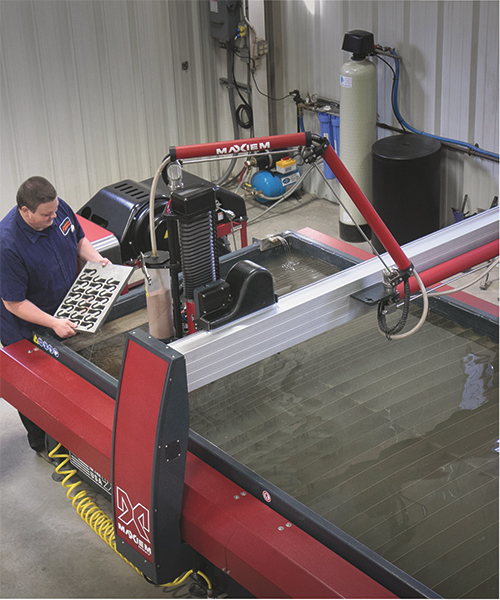 The new waterjet-cutting Machine at Perfection Fabricators, Elyria, OH, allows the company to work with various materials of varying thicknesses, greatly increasing productivity on current jobs and opening up business in assembly. Here, the third generation of the founding Ennes family, Parker, operates the equipment. The elder Ennes, who at 78 still comes to work four days per week, had been against the purchase of a laser machine, recalls Gerken. Perfection, priding itself on quick production of small parts in varying volumes, scrambled to fulfill its orders and satisfy customers. As these requests increased, the company performed its due diligence, and decided on the Maxiem from Omax, which can cut parts from many materials, including metal alloys, plastic, glass, ceramics, stone and composites, directly from CAD drawings or DXF files. Installed in February 2014, the model 1530 JetMachining Center has since provided service from prototype to production. With its laser-cutting machine employing a 4 by 8-ft. bed, Perfection opted for a 12 by 6-ft. table size on its waterjet cutter to increase the company’s cutting-area capabilities and allow extra flexibility in nesting parts. The Maxiem 1530 has a one-piece integrated nozzle with consistent jet alignment that allows Perfection to cut accurate parts of varying shapes and sizes within a 10 by 5-ft. x-y cutting travel area. The machine’s programmable motorized z axis makes it easy for operators to maintain proper nozzle positioning throughout the cutting process. The waterjet-cutting machine purchased by Perfection also includes Omax’ Intelli-Trax linear drive technology, which utilizes brushless servo motors, integrated servo drives and digital linear encoders to provide instant micron-level cutting head position feedback to the machine’s controller. The Maxiem 1530 comes standard with the company’s Intelli-Max software suite. According to Omax officials, the control software within Intelli-Max calculates the precision of the velocity of a tool path at more than 1000 points/in., allowing for complete control over the motion of the abrasive-jet. Built-in programming tools and cutting models within the software automatically optimize the 1530’s tool paths when creating 2D and 3D parts, providing Perfection with precise machine behavior predictability as to the cutting speeds, taper, jet lag and other abrasive-jet factors for those tool paths. 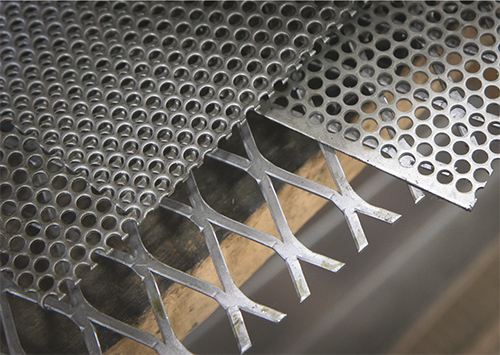 Perforated metal is just one of the materials that Perfection Fabricators runs through its new waterjet-cutting machine. Besides metals, the company uses the machine to cut glass, plastic and more. Perfection also added an A-Jet cutting head and Terrain Follower, accessories that work together to automatically and accurately cut parts from materials with irregular or warped surfaces without the need for special programming. “The laser machine probably took 60 to 70 percent of the work from our machining operations, and what we still had been machining, the waterjet machine took at least 20 percent,” says Gerken. “Using just standard cutting and machining, we may only be able to produce 10 parts/day, but with waterjet cutting, we can do 200. As the machining workload backs up, we are pressured to relieve that backup and improve production. When this would happen, we’d face fourth and 10. Do we punt or go for the first down. With the waterjet and laser machines combined, we get the first down. Perfection Fabricators uses its capabilities in laser and waterjet cutting, machining, bending and painting to produce finished parts for automotive, industrial and other customers. The addition of waterjet and laser technology has cut the use of time- and cost-intensive machining and other secondary processes. Today’s fabricators must work with a variety of materials if they are to become preferred suppliers of assemblies, which always is Perfection’s goal. The mix of inhouse technologies, keyed by the waterjet-cutting addition, allows the company to reach that goal. For example, Perfection picked up a large order where it had been shearing polycarbonate, then taking it to a separate drilling operation, using a template to place holes. Perfection’s new ability to fabricate varying materials also helps it with assembly, a value-added process that finds great favor with customers looking for a one-stop provider. For example, the company supplies one customer with high-pressure tanks for valve testing. Perfection can fabricate the metal tanks, then insert sight glass, cut on the waterjet machine, into tank holes, thus providing a finished tank. That capability keeps this business with Perfection, claims Gerken. Once Perfection purchased the waterjet-cutting machine, fitting it into the company’s production environment was a somewhat simple affair, according to Gerken. Power for the new equipment posed no challenge, since the company had already upgraded that service to bring in the laser cutter. Crews simply cut a 4 by 4-ft. slab of concrete out to install a ¾-in. water line, and leveling required only a digital level, two technicians and 20 min. After brief introductory training, Perfection unleashed operators on it to perform regular duties and test new parameters and capabilities, aided by the company’s experienced laser technician. Installation of the new waterjet-cutting machine was somewhat simple. Crews at Perfection Fabricators simply cut out a 4 by 4-ft. slab of concrete to install a ¾-in. water line, and leveling required only a digital level, two technicians and 20 min. That creativity has paid off in ways big and small. For example, to reduce cutting time, if an outside part edge is slated for welding, the machine is set to cut quickly even though doing so diminishes edge quality. Then again, for precision, say a hole must hold a 0.005-in. tolerance, the waterjet machine can do the job. Once running, the waterjet- and laser-cutting machines formed perfect complements for Perfection. Perfection also has found ways to use the two machines in tandem. 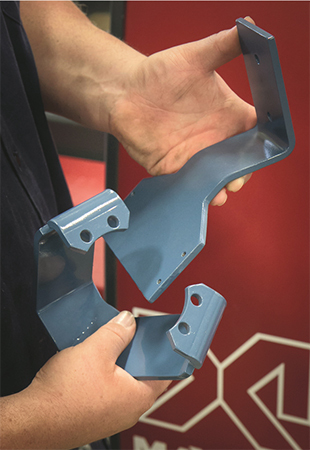 Prior to 2011, Perfection might have had to machine a certain part profile, resulting in a part cost of $125. The addition of waterjet cutting keeps Perfection busy, mixing multinational automotive and industrial customers with locals looking to repair a lawn chair. 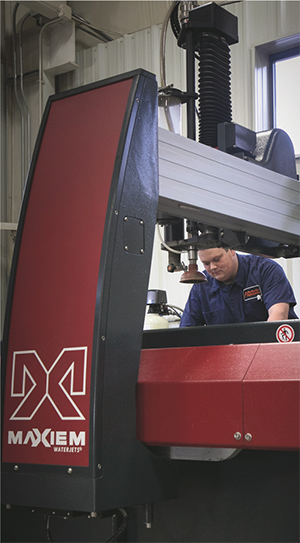 The company is looking to add to its laser- and waterjet-cutting capabilities and may take new directions in 15 years or so when the third Ennes generation, Parker, who currently operates the Omax, takes the reins. With lessons learned in adopting new technology, Perfection is not afraid to continue along that route. “If we didn’t bring in technology such as this waterjet-cutting machine,” says Gerken, “we would be at six employees and performing the same old work for customers that are okay with doing things the old way. Now we do work for customers such as the U.S. Air Force and NASA because we can. But we still work with Joe from down the street who wanted us to build 30 lantern holders for his rowboat...we don’t turn much away.